China Demand For Food and Energy Is Raising Prices and Consumer Ire in U.S.
Dude! What’s up with the law of supply and demand? The United States Department of Agriculture projected earlier this month that national harvests of wheat, corn, and soybeans — the foundation ingredients of the have-it-your-way American diet — will be strong this year. But prices for bread, meat, and milk at my local Glen’s store here in Frankfort, Michigan are going up by the week. Meanwhile, the Energy Information Administration reports that U.S. oil consumption is 10 percent lower than it was seven years ago. Net oil imports now make up less than 45 percent of the nation’s petroleum consumption, the lowest level in nearly 20 years. In other words we’re using less, and importing much less. But the BP station in town is selling gasoline for nearly $4 a gallon. Guess what? Without some very sharp departures in our strategy of feeding and fueling ourselves, there ain’t a lot we can do about it. Reason. Rising commodity and energy prices are more prima facie evidence of America’s diminishing influence in global markets, and the rise of — guess who? — China. Though we clearly don’t like it, the hard truth is that China is writing the new law of American supply and demand. Next month, along with colleagues at Circle of Blue, I make my fifth extended trip in 20 months to report on the confrontation between energy, food, and water in the world’s largest nation, largest energy consumer, largest grain producer, and second largest economy. With each trip it becomes steadily clearer that China has no intention other than serving the goal of its rocket-ride economic growth. And that means reaching deep into its own resource base, and the markets of every other nation on Earth, including the United States. Result: Americans complain about rising prices and national drift, and seriously consider electing candidates for president who are anti-science and anti-education. Meanwhile China constructs a sophisticated 21st century powerhouse economy. Here’s what some of that looks like in numbers. Two years ago, driven by China’s demand for petroleum, Asia passed North America as the world’s biggest oil consumer, according to the EIA. Consumption in Asia grew by 146 percent from 1980 to 2010. Asia now consumes 29 percent of the world’s petroleum as opposed to 27 percent in North America. In 2000, North American demand was 31 percent of world consumption, Asia 26 percent. Here’s what it looks like in oil, gas, and coal export projects to serve China’s energy demand: Kinder Morgan Energy Partners LP, a big energy transport company, said earlier this year that it wanted to spend $5 billion to double the size of its Trans Mountain pipeline that carries tar sands oil from northern Alberta, Canada to Vancouver and Washington’s Puget Sound. Enbridge, a Canadian transport company, wants to build another pipeline of similar size to carry tar sands oil to a Pacific loading facility in Kitmat, British Columbia. Both projects are essentially meant to serve China, which invested $15.7 billion from April 2010 to January 2012 in tar sands oil projects, part of a huge industrial landscape where tar sands mining and processing now yields 1.6 billion barrels of synthetic petroleum a day. Production is expected to nearly double to 3 million barrels a day by 2020. Similarly in the United States, according to the EIA, China has invested more than $4 billion in companies developing and transporting oil and natural gas from North Dakota, Pennsylvania, Colorado, and other states developing deep oil and gas-bearing shales. Meanwhile, Oregon’s Governor John Kitzhaber asked the federal government earlier this month to conduct an environmental study of projects to ship strip-mined coal from Montana and Wyoming to China through ports in Oregon and Washington. Burlington Northern would be a big beneficiary of any contracts that transport 150 million tons of western coal to be burned for electricity in coastal Chinese cities. China, by the way, also is sponsoring the same kind of coal mining and transport project in Australia, which is building new port facilities to ship over 100 million tons of coal a year, according to a new report from Circle of Blue. Behind the big plans for coal imports lies China’s overwhelming demand, which is expected to reach over 4 billion metric tons a year by the end of the decade. In 2010, the country produced 3 billion metric tons of coal annually, more than three times higher than U.S. production, which is falling due to competition from lower priced and cleaner natural gas. China’s concerns about water supply and its increasing demand for grain also has helped to prompt a huge trade in farmland around the world. According to GRAIN, a respected Barcelona-based research organization that tracks global land sales, two of the largest companies involved in buying farmland are Chinese, the Chongqing Grain Group and the Beidahuang Group. Last year, for instance, Beidahuang spent $1.5 billion for control of 330,000 hectares in Patagonia to supply China with soybeans and corn. GRAIN also reported that in 2010 Chongqing spent $300 million for 100,000 hectares of Brazil’s farmland to produce soybeans. In all of China, there are few places where the extravagance of the confrontation between rising demand for energy and food, and the country’s steadily diminishing reserves of freshwater are more visible than Baotou, Inner Mongolia. 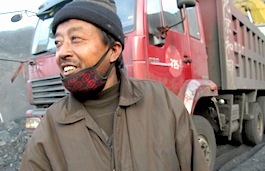 The fast growing industrial city of 1.5 million, which sits on the northern bank of the Yellow River, owes its existence to the close ties between ample coal reserves, access to water, and thousands of farmers who ensure there is enough to eat. There is no randomness to these relationships. 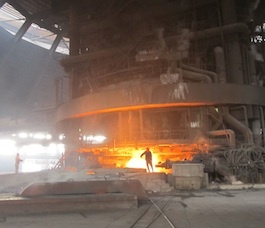 Coal, produced in the nearby mountains, powers the Baotou Steel Group’s 49-square-kilometer plant, which employs 50,000 people and manufactures 10 million metric tons of steel products a year. New water-saving technology enables the plant to recycle 98 percent of its process water in a region that receives mere millimeters of rain a year. More water-efficient farm practices, due to the competition for water that farmers are steadily losing to energy producers, keep food production high enough in the Yellow River basin. But while these ties are not random, neither are they firm and secure. Baotou’s population growth, and its surging economy are putting enormous pressure on energy supplies and farm production – the largest consumers of water – in a region that is steadily losing moisture. Coal producers and utilities, the most politically powerful industrial sectors in the Yellow River basin, negotiate agreements that assure they have adequate water from the river for mining, processing, and cooling. Steel company executives, mindful of the persistent drought in the region and the river’s declining flow, keep a close eye on the Yellow River water gauges to assure themselves they have enough to run the plant. Farmers plant and sow their crops in irrigated fields that year by year receive less water. And the Yellow River itself transports much less water than it did in 2000. In short, the converging trend lines – rising demand for energy and food, declining quantities of fresh water – are challenging the durability of Baotou’s new prosperity and undermining China’s economic security as well. The question for China and the rest of the world is how aggressively China will continue to pursue its rapid economic growth, and thus its rapacious national and global campaign for resources? One answer lies east of Baotou, past thousands of plastic-sheeted vegetable greenhouses and kilometer after kilometer of brittle-brown farm fields, where hundreds of coal trucks swarm the entrance to the Daqing Shan open-pit coal mine, one of the largest in the world. On one side of a row of booths, manned day and night by young inspectors, a crush of empty coal-hauling trucks, black and belching diesel fumes, inch steadily forward like a pod of Emperor penguins shifting to a new feeding ground. On the other side of the booths an even larger pack of loaded trucks, each carrying 80 metric tons of coal, lurch and squeal in a formation so tight that front and rear bumpers nearly touch. One by one, in a frenzy of honking horns and growling diesel engines, trucks pass through the gates. Some head empty, single file, up a menacing narrow road to the mine. The others, so fully loaded that chunks of coal tumble to the ground, make their way to a processing station that is reachable on a two-lane highway so blasted by their weight that the pavement is all pitted buckles and cracked swales. More than 1,000 fully-loaded trucks pass the weigh station daily, 82,000 metric tons every 24 hours, more than 30 million metric tons a year. Along with the truck drivers, hundreds of other men work in the mine, which is so deep that the yellow-painted mining equipment at the bottom looks like grubs digging in the dirt. Along the route up and beside the coal-dust roads in the mine, broken down trucks lie like dead beasts—tipped over, collapsed from fractured axles, charred from brake fires. By one measure, Daqing Shan is a stunning display of China’s determination to fuel its modernization. By another measure, the mine—which stretches miles in every direction—is a grim tableau of just how torturous fueling China’s surge to global economic influence has become. In 2010, China produced more than three billion metric tons of coal from existing mines that are nearing capacity. More than 80,000 coal trains a day haul a total of 1.8 billion metric tons of coal annually on China’s railways, according to national records. The railways are choked with coal now. Trucks, as a result, now carry much of the rest of the country’s coal—more than one billion metric tons—from northern mines, causing traffic snarls that take hours to clear and turning paved roads to deeply rutted and barely passable trails. 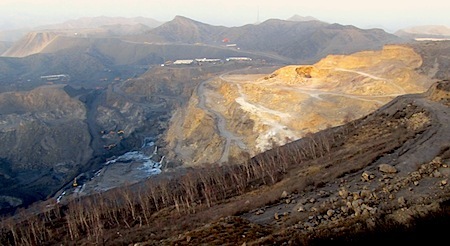 Even though Daqing Shan contains hundreds of millions of tons, the limit of how much coal can be transported to market each year is close to being reached.